Ann Herbert Scott was born in Chestnut Hill, Pennsylvania, and grew up writing. Her first children's book, co-authored with a friend and never published, was written at the age of 13. Many honors and children's books followed with a hiatus to marry and raise a family. Today, Ann is one of America's foremost authors of children's literature. She deftly uses her B.A. in English (University of Pennsylvania) and M.A. in Social Ethics (Yale University) to bring both credibility and wonder to her work. Many of her books deal with western, ethnic, and rural themes. Ann moved to Reno in 1961, when she married William Taussig Scott (1916-1999), a physics professor at the University of Nevada, Reno. Her work as an "enumerator" in the agricultural census of 1964 eventually led to her writing a history of the U. S. census, with the cooperation of the Bureau of the Census. Her novel Sam was an American Library Association Notable Book for 1967. 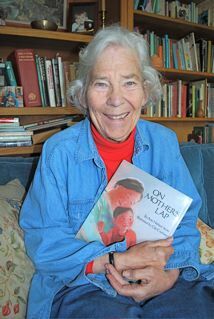 Another of her books, On Mother's Lap, was read by Captain Kangaroo on his television program as part of the national Reading is Fundamental literacy initiative. In 1996, the paperback edition of Cowboy Country was awarded the Parents' Choice Silver Honor. Ann is active in the Northern Nevada arts community and is the co-founder of the Annual Art of the Children's Book Festival. She and her husband were co-founders of Sierra Interfaith Action for Peace, a non-profit public benefit corporation in Washoe County, Nevada. Grandmother's Chair. New York: Clarion, 1990. Hi! New York: Philomel Books, 1994. Not Just One. New York: Lothrop, Lee & Shepard, 1968. Sam. New York: McGraw-Hill, 1967. McDonald, Megan, and Ann Herbert Scott. Paperback Plus Teacher's Resource. (Invitations to Literacy series). Boston: Houghton Mifflin, 1996. Sam: Teacher's Guide. Oakland, CA: Developmental Studies Center, 1993.